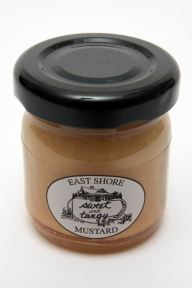 1.4 oz glass jar sweet and tangy mustard. A convenient travel size for on the go. Ingredients: cider vinegar, sugar, mustard flour, eggs and spices. No salt added.